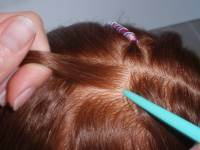 If you want easy braiding, you need to prepare the hair first. 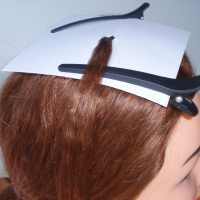 It is useful to have a tail comb, hair protector card and clips. Check out the tools page for more info. 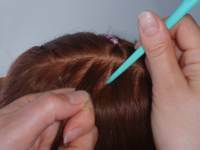 You can braid any section of hair you want, but for your first braids it's best to choose hair at the top of the head, near the parting (split). 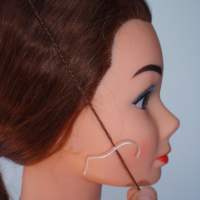 Another popular place for a braid is just behind the ear, but this is a bit more awkward for your first braid. Choose a neat square section of hair, about 1 to 1.5cm each side at the most. A tail comb can help with this. Check the braids and hair types page for more information on braiding in thick or fine hair. 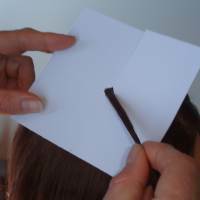 Place this hair inside a hair protector card and clip the card to the head with sectioning clips. Tie or clip the remaining hair well out of the way. Divide the braiding hair into three equal sections and plait (braid) it. 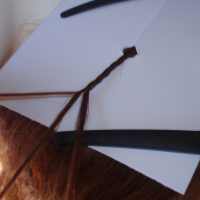 At the end of the plait tie with a small piece of braiding thread to stop it coming undone. you can wet the hair slightly. 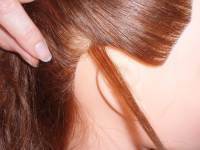 This makes the hairs lie flatter and less likely to stick out of the finished braid. If it is one of your first braids and you are working slowly, you might need to wet the hair again before you have finished, so keep some water handy. OK - now you are ready to cut the threads and start braiding.